Bruce and Lani's house has been in the family for over 50 years and are unwilling to get rid of the sentimental home. They are also unwilling to continue living in the cramped space with few working appliances and a mismatched laminate floor, so the young couple admit they need Marc's help. With Marc's aid, they knock out an entire brick wall, replace it with a steel beam, and install a thick wet bed in the floor for brand new tiles. 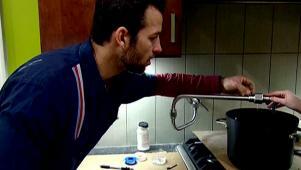 They're not just for restaurants anymore: Marc installs a handy pot filler.